Another Sunday night snuck right up on me, hope everyone enjoyed their weekend. Had an embarrassing morning at church with my boys practically fist fighting each other in front of the entire congregation, not to mention the nice names they were calling each other! Little turkeys. Did anyone else go see Batman over the weekend? I found it totally creepy, but really good. I can’t remember the last time I sat through a movie that was so long, probably Titanic. Kind of eerie to see Heath Ledger as the Joker, knowing what happened to him, I’m betting his performance wins all kinds of awards. When I was at Sprouts this week, I picked up all of the ingredients to make this sandwich that sounded so good in my mind. It is officially my new favorite sandwich. I have been on the hunt for fresh figs, but found out I was too late, they are apparently out of season, so I picked up some fig jam/spread and it was fantastic. Keep a eye out for some next time you are at Sprouts or a Whole Foods type of grocery store, it’s well worth the 5 bucks. The creamy Brie cheese goes so well with the sweet fig jam, it is such a treat. Try it on crackers too. How cute are these little toothpicks? 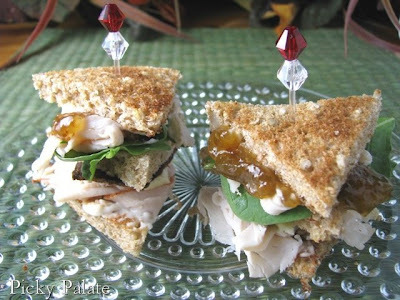 I found them at AJ’s, I thought they were the perfect fit for these fancy little sandwiches! 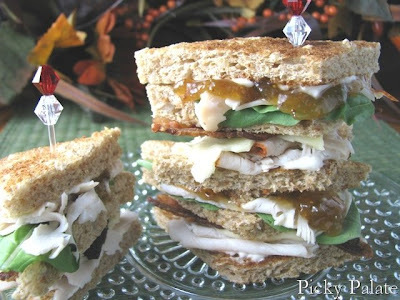 Hope you’ll treat yourself to a fun turkey club this week, you’ll be glad you did! 1. Cut crust off of toast. Lightly spread mayonnaise onto inside of bread. Layer with turkey, brie, bacon strips, arugula, another piece of toast, more arugula, turkey and then a small spoonful of fig preserves. Top with another piece of toast. Cut sandwiches into 4 pieces, diagonal cuts to make little triangles. Serve and Enjoy! Coming up next is another brownie creation that tops all the rest! You won’t want to miss it! Where to start, the recipe looks yummy the picks attached to the sandwiches looks great and the ingredients are mouthwatering. Whenever we go to Church my daughter without fail will start making ridiculous noises (usually during a prayer!!!) because she likes the echoey sound it makes. These sandwiches look great. I bought a lovely bit of brie from the french market at the weekend and some red onion chutney so thats what Im having for my lunch today, but the figs sound great. Will have to try that another time. I saw Dark Knight last week and I agree – it was LONG. The movie and Heath Ledger's performance were great, though and I now have a little crush on Christian Bale. On to the sandwiches, love the presentation & of course, the delicious ingredients! Oh amazingly good. 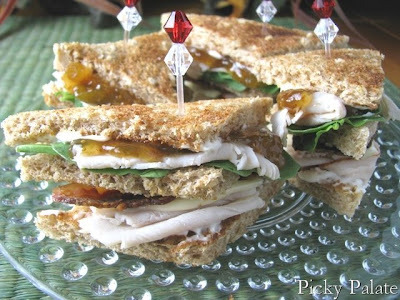 The figs and brie on a turkey club is genius. Thanks for visiting, hope to see you here again! Glad to know I’m not the only mom with crazy children!! Yah, when did Christian Bale get so good looking? I couldn’t get over the raspy Batman voice though, it was too wierd. Now, I’m putting fig on everything, I love it! I thought figs weren’t in season until late summer/early fall? We have a fig tree in our back yard that was planted by the previous owner and when I read up on it, I thought it said we could harvest them in the later part of the summer. But, we’re in Washington state so maybe it’s different in other areas of the country. My dad’s grandma used to make fig preserves when he was a kid so I want to find a recipe for fig preserves and surprise him with it. I saw The Dark Knight and really, really liked it…although I agree it was pretty creepy! Looks so dainty and delicious! Can’t wait for the latest and greatest brownie creation. best of luck. they still might have some at your costco! I also saw Batman..It was good..however I am not a comic book movie fan sooo I am not going to rave about it!! Also thanks for casting your vote on my video posts. I do enjoy doing them..I just wanted to get opions of people, because I just dont want to annoy anyone!! This is totally my kind of sandwich! 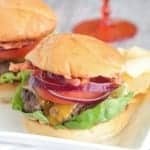 Looks delish!! I’m not going to take the word from the Sprouts worker that told me they were out of season, I’ll keep looking around. I’ll check my costco next time I’m there! I was never a comic book reader either. I was surprised I enjoyed the movie so much! Have fun with your video posts. Your story totally reminds me of something my boys would do. Too funny! Gotta love em! Enjoy the movie, bring some snacks, it’s a long one! these sound really great. LOVe thos toothpicks! when buying brie, how do you know what kind do buy? i like it, but not when the flavor is too terrbly strong. any guidelines? Ha ha – did you see what I wrote on my blog? I saw Batman this weekend, too. It was so long! But Heath Ledger was really good. I hated how he kept licking his lips. The sandwiches look great! I love the picks…so fancy. I don’t have any specific guidlines for buying Brie, I like it all. Maybe ask someone in the deli if they have a mild Brie. I bet you’d like the combo of Brie and fig though, give it a try. Yah, what was up with the licking lips? Must have been part of his character. Overall, really entertaining. I’ve had no luck looking for figs here either! Cute little sandwiches! As for embarrassing days at church.. all in one day…my 3 year old screams “Holy Crap” during the most quietest time…and then later in the crowded hall my 1 year old slaps me across my face. I wanted to hide under a rock that is for sure! I just love the picks!! Brie with figs is just a perfect combination-pretty, pretty. Now I have to ask my mom to pick me up some super-cute toothpicks from AJ’s on her next trip out to Scottsdale! I love the brie-fig combo too. These look delicious! It is comforting to hear other stories of embarrassing moments! Thanks for sharing! I love AJ’s, they have such fun things. They had some other really cute little picks with colored round balls at the end. I might have to go get those too! Hi again! Did you redo your site? I could have sworn I had been here but none of this looks familiar. Perhaps I had seen it on so many other links lists and I MEANT to come but never did… Either way, I’m too young for my brain to be tripping like this! Your site is great, I can tell that you are way, WAY more technical and computer savy than me! This is the kind of blog my little baby aspires to be when it grows up. Where is your video? Just from seeing your picture, I can tell that we will be meeting in NYC very soon, you look like some one who can put together a decent video. I am only banking that I will be there because with there only being 4 entrants… pretty much yeah… I’d say it is a pretty safe bet I’ll be there with you since it sounds like they were at least intending to pick more than one person. The sandwiches look great and I love those pics, what a great idea! I’ve got a foodie friend who always has the greatest dishes and accessories for plating, I am getting those so that I can show her up for once! Btw, You’ve still got time if you’d like to participate to my Original Recipes round-up…deadline is on August 15th. Really cute sandwiches! I bought fig jam at whole foods and actually have used it on a pizza with prosciutto and goat cheese. What great sandwiches! These look like they would be perfect for a party. Yum! Gosh, I haven’t had figs since I was a little girl. My grandpa had a fig tree in his backyard. Oh how I loved them. It sounds delicious on this sandwich! Mmmm…brie and fig jam on crackers! Great idea. I’m going to try it! It sounds like it would make a great appetizer, something I’m always in need of! The sandwiches look yummy. I absolutely love Brie cheese and adding the sweet jam to the sandwich just puts it over the top! Hey! I tagged you in a 6 word memoir meme if you’re interested! My Dad just finished putting up figs from our trees at home. I am going home in a few days. Guess who will be batting her eyes and begging for a few jars so she can make these sandwiches? Just letting you know…the Gilbert Costco on Market St. has fresh figs…I saw them there today! Love your blog!! Those sandwiches look good. 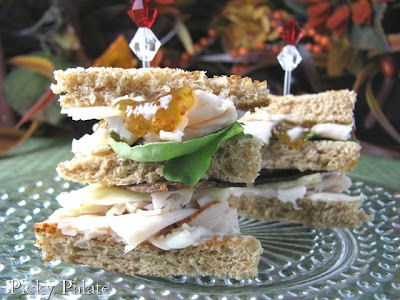 I really like the idea of using preserves or jams in a savoury sandwich like this. your little toothpicks are so elegant and cute! And yes! I saw Batman over the weekend and I thought it was awesome! Jenny: Your lasagna ciabattas are delish. I posted them on my blog tonight. Thanks for the great recipe. I love Club sandwhiches. These look really tasty too. And I really like the toothpicks!! !